The second largest school district in the nation is in the midst of rolling out an ambitious program to put iPads into the hands of 600,000 students by December 2014. And because the technology is so new to both students and teachers, the program is raising questions about the new tools' efficiency and implementation, and its cost to the city. Is the technology helping students score better test scores? How do the devices change the role of the teacher? Are iPads too distracting to some students? KPCC education editor Evelyn Larrubia sat down Wednesday, December 4 at KPCC's Crawford Family Forum with educators and researchers to explore the effects of iPads in the classroom. The jury is still out when it comes to proving whether tablets—specifically iPads in the Los Angeles Unified School District—are effective in improving test scores or curriculum learning in general, Burch says. "There is quite a bit of research out there and the research is quite mixed, but the research that's been done largely was done before the web boom, so it's somewhat dated," she says. "We're just at the tip of the iceberg when it comes to that research." Lucas, who has been tasked with implementing the program at LAUSD, says there is a lot of research supporting the benefits of having "one-to-one" devices in a classroom setting and teachers play a critical role in how the devices are used. "I saw first hand what a one-to-one device can do when integrated well," Lucas says. "It's not the fact that the children have a device—it's how does the teacher use the device purposefully, and with meaning, to access the curriculum for the boys and girls." 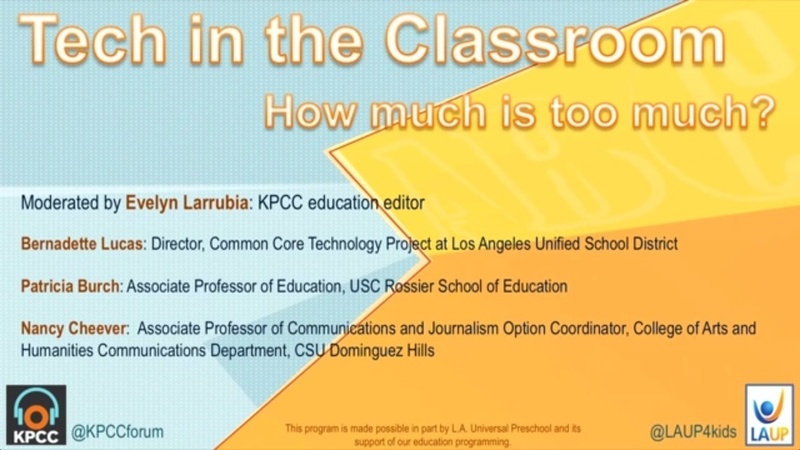 At the center of LAUSD's rollout of the program is its implementation and how that affects teachers and students alike. Burch says that in an ideal world, iPads will allow students—especially those who take care of their younger siblings—to get tutoring outside of school. In reality, Burch says both students and teachers must account for lost set-up and troubleshooting time when an unfamiliar device enters the classroom. Lucas says in some cases students will be teaching their teachers how to use the device, as students may be more familiar with the technology. But in the end, she says the success of the iPad implementation will rest on teachers. "I think whenever we're talking about a cultural shift…teachers will lead this effort," Lucas says. And that translates into pressure for teachers and administrators alike, says Burch. "I think yes, it's coming down quite fast," she says. "We can't stop the train but we can certainly make some informed decision so that it's done well." Just as teachers are interested in the impact the new technology is having on schools, parents are keen to know the impact technology has on their children's growth, particularly their brain development. Cheever says both parents and teachers should be concerned about the consequences of allowing more digital time to children who may already be exposed to similar devices—like iPhones and laptops—outside of the classroom. "Very young children should not be exposed to too much technology, she says, "because technology does something to our brains, especially when it involves flashy visuals and lots of auditory and multi sensory sort of experiences." Younger children should have less screen time than older children, like teenagers, Cheever added. "There's something called 'basic rest and activity cycle' that is really important in children's brains as well, and it's important for all of us, where we really need to take breaks from technology," Cheever says. "There's something called a 'cognitive load', and some tasks can take a lot of cognitive load and can really complicate our brains, and we need to rest our brains to be healthy." Introducing a flashy new gadget to a classroom setting can be distracting at first, KPCC's education editor Evelyn Larrubia suggested. Lucas agrees. "To me, that's part of the cultural shift," says Lucas. She says she's witnessed it at her school, where iPads were introduced before she stepped into her current role at LAUSD. "You give them that time to explore, you empower them with tools to make good decisions and you accept that it will take time, and you monitor all those procedures, rules and protocols." Lucas, who is an advocate for the use of the iPads at LAUSD and has developed procedures to put the technology on the hands of students and teachers, says it really comes down to how the teacher uses it with the curriculum, which is at the center of the debate as California teachers shift form the California CORE to the Common Core State Standards. Along with the new iPads, Lucas says they've also introduced a program she calls "digital citizenship." She says LAUSD wants to teach students, from an elementary school age on up, to "make good decisions with the use of technology." "Whether or not the kids have a district-issued or school-issued device, they have access to devices outside of school," she says. Lucas avoided giving specific details about LAUSD's plan to fund the program's infrastructure and training for the long run, but she says they are looking for alternative revenue streams. She says she recognizes that the LAUSD's goal is ambitious and that there have been infrastructure problems bedeviling its implementation, but she defended the program, saying the new technology is something kids will encounter whether or not they have access to it in the classroom. "This is the world that they're going to be a part of," she says. "And it's going got have iPads and cell phones and different devices."